See if braces are in your child's future. Most parents plan ahead for braces. What we find is that most parents have a pretty good idea of whether their child is ready for braces. And by the time they visit us, parents have an idea of their budget for braces. But some parents don’t know that some children’s treatments start earlier than others. Since some problems get treated before all the permanent teeth are in, you will want to continue reading to see that the right problems get treated at the right times. What problems should you check before all their baby teeth fall out? Many parents don’t realize that some dental problems only have a narrow window of time for the best treatment. Obviously, most cosmetic problems can wait until the adult teeth are in. But the way that the adult teeth come in affects their health and appearance for the rest of your child’s life. If the tooth emerges through the gum incorrectly, it can cause gingival recession. Adult teeth that don't have room to fit come in out of place. You have probably seen gingival recession before. It's when the gum erodes away, and the sensitive root of the tooth gets exposed. They make special toothpaste to help with the sensitivity, but it's better if recession can be avoided altogether. Gum recession happens when the tooth is not supported by the bone. The way that gum recession happens in children is if there is not enough room for the tooth to line up properly. So instead of the tooth coming up in alignment, the deflection causes the tooth to appear like it is poking out towards lips and cheeks or falling inwards towards the tongue. A lower adult tooth falling inwards towards the tongue because of crowding. In either case, the tooth that is out of position won’t be supported by the U-shaped bone of the jaws. In severe cases, the lack of bone support can lead to the loosening and loss of the adult tooth. To prevent problems with the adult teeth coming in, your child would need to visit before all the baby teeth fall out. 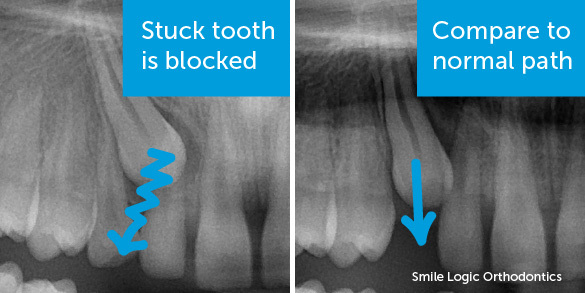 When kids see an X-ray of an impacted tooth, they tell us that it looks stuck. An adult front tooth is blocked from coming in. Note that the stuck tooth overlaps and to damages the neighboring adult tooth. A stuck tooth can cause problems because the adult teeth are supposed to erupt at certain ages and in a particular sequence. So if one tooth is stuck, it’s probably going to affect the tooth beside it, too. The main risk of a "stuck" tooth is that the tooth will torpedo into a neighboring tooth and weaken the roots of the neighboring teeth. So instead of a problem of one "stuck" tooth, you end up with a stuck tooth and having to remove the weakened adult teeth on either side. That means there would be gaps where the adult teeth should be. The most common reason for stuck teeth is that there is some physical barrier that is blocking it from coming in. That “road block” could be a traffic jam of teeth caused by crowding. Or it could be an extra tooth in the way. Or it could be because of a strong baby tooth that won’t wiggle loose. Or it could be something rare like primary failure of eruption. We wouldn’t know until we study the X-ray. The most common extra tooth forms right between the top two front teeth. And it will often block the two front teeth from coming in properly (or at all). It’s rare enough that it doesn’t make sense to be screened for it unless the two front teeth don’t come in properly. Other extra teeth and tooth-like formations (e.g. odontomas) can cause similar problems. But they are even rarer. The most commonly missing teeth are the wisdom teeth. And missing wisdom teeth aren’t usually a problem. 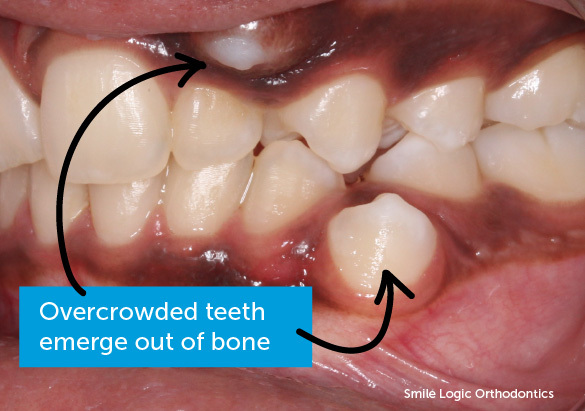 But the second most commonly missing teeth are the upper lateral incisors. Yikes! Missing teeth right up front. If we know they are missing, we have treatment options. But for the best-looking result, we need to guide teeth in the right direction. And that means seeing your child before all the baby teeth fall out. Is it the right time to visit a specialist? 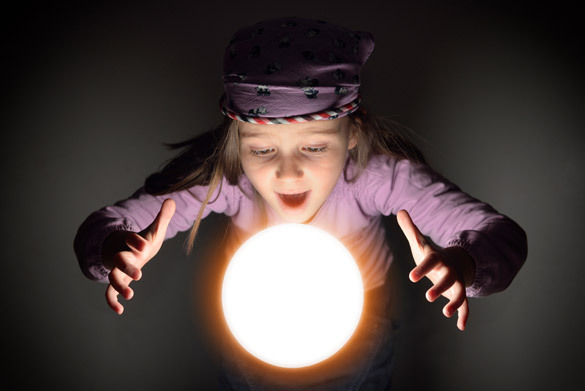 If now is not the right time to for your child to visit us, then we should wait to meet. On the other hand, if you think it’s the right time for your child to get help, you’ll want to call 732-355-7060 to book a free consultation.